"Through [the printed Bible], God will spread His word; a spring of pure truth shall flow from it; like a new star it shall scatter the darkness of ignorance, and cause a light hithertofore unknown to shine among men." "...it would be more consistent that we called [the Bible] the word of a demon than the Word of God. It is a history of wickedness that has served to corrupt and brutalize mankind." A modern English translation of the Bible costs anywhere between two dollars and two hundred dollars. It can also be read free on the internet. Yet the highest price for a Bible is negligible when compared to the many lives it cost to translate it into English. 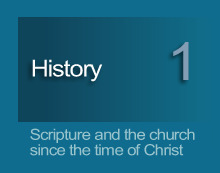 The Bible was actually banned at one time by certain religious leaders who claimed to follow Christ. Needless to say, the Bible does not advocate banning itself, nor does it demand the death of those who read it (as was once a penalty imposed).The explanation is utterly fascinating, but far from quick. The proceeding History sections will skim the last 2,000 years to hopefully provide you a basic understanding of the Bible's role in the historical events such as the Crusades, Inquisitions, and Reformations. By reviewing these ancient times and events, you will see why the Bible was so highly esteemed by the courageous men and women who sacrificed their lives to establish the English translation. 1.2 Introduction to the Crusades and the Inquisitions. In short, the death sentences for reading the Bible and similar atrocities were an outgrowth of the Inquisitions. The Inquisitions were an outgrowth of the Crusades, and the Crusades were a product of many forces. One of those forces which will be discussed was the relationship between the ancient Church of Rome and both its religious and secular counterparts of the day. Many people associate the Crusades and Inquisitions with the Bible and Christianity. This is understandable. Certain persons within one of the most influential religious institutions of medieval times, the pre-Reformation Church of Rome (or Roman Catholic Church), claimed to exalt Christ yet had involvement in starting those affairs. However, to blame the terrible atrocities of the Crusades and Inquisitions on the Bible or the Bible's teachings is to err, as the aforementioned penalty for reading the Bible should suggest. Because certain religious leaders killed people for trying to learn what the Bible actually said, the Bible itself can be added to the long list of victims of the atrocities of those dark ages. If all these historical elements behind the English-reading Bible were not complex enough, conflicting perspectives going on over latter eras coalesce into the so-called Christian divisions of Catholicism and Protestantism. These divisions arose partly as a matter of biblical interpretation. IMPORTANT: There are not two types of Scripture - Catholic and Protestant, nor two types of Christianity, nor more than one way to become justified before God. If anyone has any doubts of this, please read What is the gospel? Whether you are part of a Catholic denomination, or a Protestant one, or none at all, the denominational classification of your beliefs has nothing to do with whether or not you are truly in the kingdom of God and will see heaven. The sections herein will only partially reveal the differences between Catholicism and Protestantism. Do not presume that a formal or complete argument between the two is being made, or that theology was the only force that shaped ensuing events. Also be aware that this author favors the position of Protestantism. While Catholicism and Protestantism both revere Jesus and the Bible, important differences nonetheless exist and a few will be pointed out. Clearly there are persons outside of Christianity who say they remain so because of the heinous criminal events of the Crusades and Inquisitions. These are events which are inseparably tied to specific popes of the pre-Reformation Roman Catholic Church. The murder and tortures these popes sanctioned were not done by biblical directive, nor is it even likely those popes would have so justified them. Rather, certain popes' actions were based upon what they inferred to be divine favor bestowed uniquely upon them by God. Because modern Catholicism's own historians now refer to these popes as anti-popes, their mention herein should not be considered an outsider's vilification of the papal office. Recalling unbiblical acts by certain ancient church officials should not be viewed as a general indictment against the reformed Catholic Church or Christian Catholics, and neither is it justification for any ungodliness upon the part of their Protestant counterparts. This is an introduction to the historical sections which include the fascinating and terrible times of the Crusades and Inquisitions; times which were heavy on religion, but light on obedience to biblical teachings. This section also features a disclaimer urging the reader that certain foregoing sections and statements are not intended to be end-all arguments in the Catholic vs. Protestant debate. If I dwell on the differences between the two, it is only because there otherwise exists a sea of commonality between them; namely the veneration by both of Jesus Christ as Lord.